Whether we recognize it or not, this truth daily confronts us, we face an enemy here in this life. It's more than what we can see before us. It's more than another person who we think has wronged us. It's more than our own struggles and weaknesses we deal with, or the negative self-talk we sometimes battle. This enemy is real and fierce. He will stop at nothing to try to bring you defeat and destruction. Maybe you've noticed too. Because if you're a believer who is living like salt and light in a dark world, you won't go for long without encountering obstacles and attacks he'll hurl your direction. We can be assured, this enemy hates Truth. So if we're living by it, standing on it, seeking after it, we will be targeted. God's words are true, this battle is real, many times it feels intense. But here's the powerful hope that keeps us strong: God is greater than whatever we face here in this world, and He fights for us still today! If you're in the heat of the battle right now, or if the enemy feels hot on your trail, please know you're not alone, not ever. Neither are you left to fight on your own. Many of us are in the battle with you, and God is the One who fights on our behalf, constantly shielding, protecting, strengthening, even when we're unaware. We never have to struggle to fend for ourselves, but He's with us, always, covering us, in all of our days. He's given us His words that are powerful and true, so that we'll have the wisdom to stand strong against the enemy. As I read these verses this morning, the reality struck me again that Paul wrote them while in chains, in prison. Yet the truth is - the enemy, no matter how vicious his schemes, can never chain our spirits that have been set free by Christ. Paul was not silenced by the cruel attacks from dark forces. Neither should we be. "A final word: Be strong in the Lord and in his mighty power. Put on all of God’s armor so that you will be able to stand firm against all strategies of the devil. For we are not fighting against flesh-and-blood enemies, but against evil rulers and authorities of the unseen world, against mighty powers in this dark world, and against evil spirits in the heavenly places. Remember, your battle today may be more about what is unseen than what you see before you. And when you resist the enemy, God's word reminds us in James 4:7 that he has to flee. Stand strong my friends, grace to you this day. He loves you. 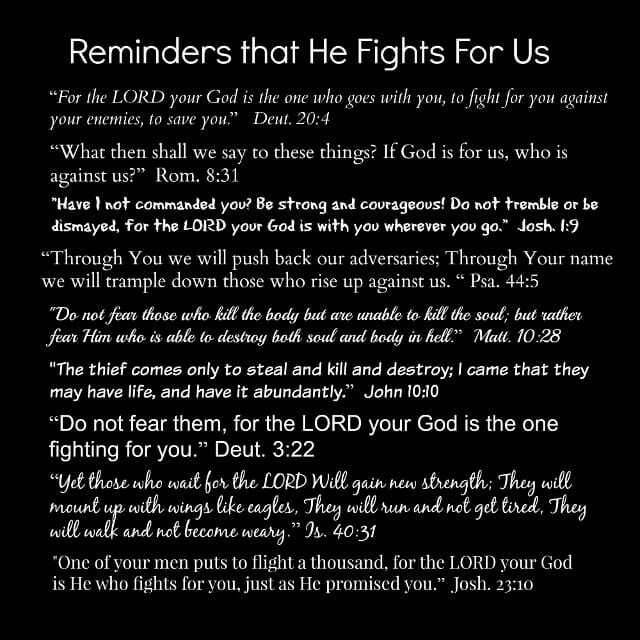 He fights for you. He is with you. We thank you that you hold the victory over sin and death in this world. We thank you that you came to set the captives free. We thank you for your redemptive work you’ve done in our lives. We thank you for freedom and the hope you bring. Your word says to “stand our ground,” and that’s what we will do, in the power of your Name. The enemy has no control over us, and we bring your word of Truth as weapon against his schemes. We know that we do not fight alone, for you are constantly at work on behalf of your children, shielding, protecting, strengthening, exposing deeds of darkness, covering us from the cruel attacks we face even when we’re unaware. We ask that you would give us wisdom and discernment to recognize the schemes of the enemy in our lives and to stand strong against his work. We ask that you would remind us to pray, constantly, for all believers. We ask that you would help us to stay alert in a dark world. We ask that you would help us to be salt and light, that we would be loving and gracious, yet unyielding to sin. We ask that you help us to remember to put on your armor daily, for you give us all that we need to stand firm in this day. We thank you that though you remind us in your word that the whole world lies under the power of the evil one, 1 Jn. 5:19, you are still greater and we have overcome, 1 Jn. 4:4, because you have set us free, Jn. 8:36. We thank you for your truth, “no weapon formed that is formed against you will prosper,” Is. 54:17 and that you tell us this is our “heritage” in you, our inherited blessing, place of possession, and gift straight from your hand. We ask for you to comfort all who weep, for those facing tragedy, loss, and devastation. Lord, we ask for your peace, we ask for your protection, we trust you for your constant work on behalf of your children. We ask that you would bring justice for those who have been wronged and persecuted, we ask that you would bring to light what needs to be brought to light, knowing that you alone are Truth. We pray for all who need to hear the message of hope in Christ, we pray for your Power to set them free. We love you Lord. We need you. We stand together in your great and powerful Name. We don't ever have to walk in fear. For when we belong to Christ, the enemy never has the final word. We are secure in God's hands and He tells us to "stand firm." Whether in life, or in death, we may always be found standing firm for the cause of Christ.